Info: Live At De Roma is available on iTunes worldwide. This project ws made possible by the formidable master Bert Joris. With his working relationship with The Royal Flemish Philharmonic Orchestra, a dream came true for me. Maestro Martyn Brabbins conducted the orchestra. 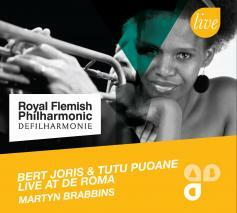 Bert Joris- trumpet & all orchestral arrangements. Ewout Pierreux – piano. Nic Thys – bass. Martij Vink- drums.